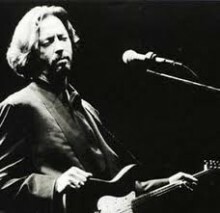 Eric Patrick Clapton, (born 30 March 1945) is an English guitarist and singer-songwriter. He has been referred to as one of the most important and influential guitarists of all time. In the mid 1960s, Clapton departed from the Yardbirds to play blues with John Mayall & the Bluesbreakers. Immediately after leaving Mayall, Clapton formed Cream, a power trio with drummer Ginger Baker and bassist Jack Bruce.